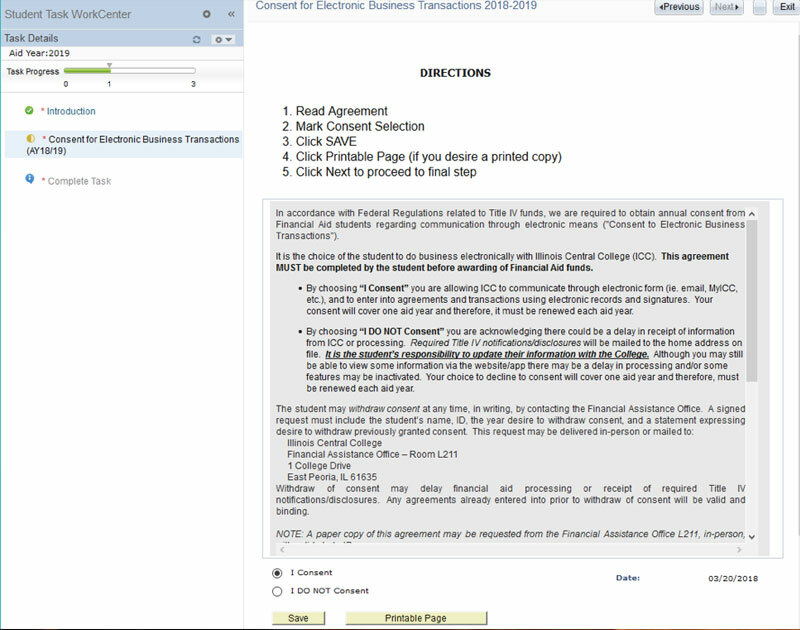 Students will need to complete their eServices To Do List item labeled Consent for Electronic Business Transactions to avoid delays in financial aid awarding. Once you click on the link in your To Do List, you will need to follow the prompts to complete the E-Consent for Financial Aid. You must select Finish on the last page to complete the consent. If you do not mark Finish, it will remain a To Do List item. If you select I DO NOT CONSENT and you change your mind, you will need to request in person or from your ICC email to have the eServices form reset. The form will be re-opened within five (5) business days and you will need to log in to eServices and complete the consent again. If you select I CONSENT and want to change it to I DO NOT CONSENT, you need to submit a request in writing to the Financial Assistance Office. You will begin receiving notices pertaining to awards by mail. The Self Service Financial Aid view will look like the below 2018 line if you select I DO NOT CONSENT to Electronic Notifications. 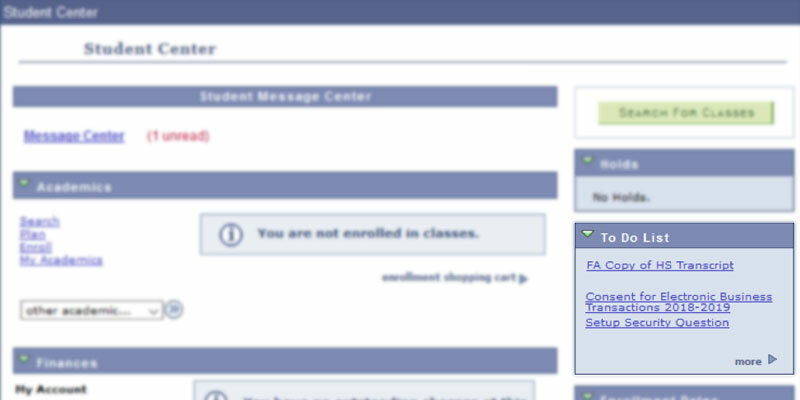 You will not be able to view any Financial Aid awards through your eServices. In accordance with Federal Regulations related to Title IV funds, we are required to obtain annual consent from Financial Aid students to communicate through electronic means ("Consent to Electronic Business Transactions”). It is the choice of the student to do business electronically with Illinois Central College (ICC). This agreement MUST be completed by the student before awarding of Financial Aid funds. By choosing "I Consent" you are allowing ICC to communicate through electronic form (ie. email, MyICC, etc. ), and to enter into agreements and transactions using electronic records and signatures Your consent will cover one aid year and therefore, it must be renewed each year. By choosing 'I DO NOT Consent" you are acknowledging there could be a delay in receipt of information from ICC or processing. Required Title IV notifications/disclosures will be mailed to the home address on file. It is the student’s responsibility to update their information with the College. Although you may still be able to view some information via the website/app there may be a delay in processing and/or some features may be inactivated. Your choice to decline to consent will cover one aid year and therefore, must be renewed each aid year. Withdraw of consent may delay financial aid processing or receipt of required Title IV notifications/disclosures. Any agreements prior to withdraw of consent will be valid and binding until otherwise notified. NOTE: A paper copy of this agreement may be requested from the Financial Assistance Office L211, in-person, with valid photo ID. By selecting “I Consent”, you agree that ICC may provide you with the following communication items through MyICC eServices, ICC email, eServices Message Center, or mobile app push notifications. Technology requirements for hardware/software can be found via links at: https://eservices.icc.edu/. All major browsers (Internet Explorer, Mozilla Firefox, Google Chrome) are generally supported, but Google Chrome and Mozilla Firefox are preferred browsers. Please see either the App Store or Google Play Store for specifications related to the MyICC app. By completing this document, you are electronically signing and agreeing to all terms and conditions. The College may retain and store an electronic copy of this document and the related decision (Consent, DO NOT Consent). An electronic record is considered the same as an original signed document for all purposes.